In Lu Blames Global Warming on CFCs (Curve Fitting Correlations), Dana clearly demonstrates that Lu 2013 is a "dog that won't hunt." Becasue Lu's erroneous findings have been widely trumpted by the folk in Deiersville, it is no surprise that Dana's skillful dissection of it garnered the most comments of the articles posted on SkS this past week. MarkR's New study by Skeptical Science author finds 100% of atmospheric CO2 rise is man-made drewthe second highset number of comments. The article summarizes the findings containted in Richardson 2013. "Much has been made of a short-term reduction in the rate of atmospheric warming. 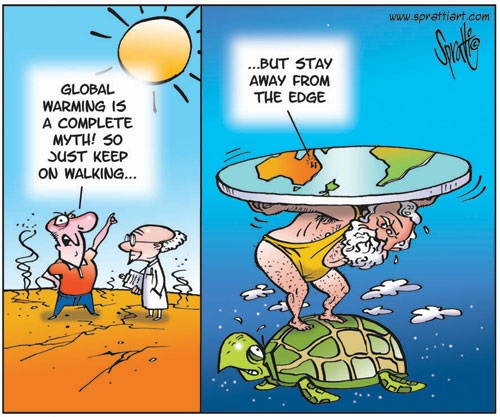 But “global” warming requires looking at the entire planet. While the increase in atmospheric temperature has slowed, ocean warming rose dramatically after 2000. Excess heat is being trapped in Earth’s climate system, and observations of the Global Climate Observing System and others are increasingly able to locate it. Simplistic interpretations of cherry-picked data hide the realities." "As some environmental analysts had hoped, President Obama and President Xi Jinping of China found room to maneuver on global warming in their California desert retreat. They sidestepped the super wicked issues impeding restrictions of the greenhouse gas of greatest concern, carbon dioxide, and staff released a joint statement on plans to cut releases of hydrofluorocarbons, or HFCs, a potent group of heat-trapping gases." Dana updated the Advanced version of the rebuttal article, It's CFCs, by including information about Lu (2013), the subject of his post, Lu Blames Global Warming on CFCs (Curve Fitting Correlations). Dana also created the Basic version of It's CFCs. The list of consensus project republishers continued to grow this week, including references in The Washington Post, by UK Energy and Climate Change Secretary Ed Davey, and by Dana in The Sacramento Bee. At The Convseration, Andrew Gilkson referenced The Escalator in debunking the Lu (2013) CFCs paper. Greg Laden featured a very nice debunking of the 1970s ice age predictions myth by David Kirtley, who identified a Time Magazine cover photo that was doctored in 2009. John Mason's Video: Lake El'gygytgyn, Pleistocene super-Interglacials and Arctic warmth was also re-posted on A Liberal's Hit List. Biodiversity underpins the life-support system of our planet. Both natural and managed ecosystems deliver important ecological services such as the production of food and fibre, carbon storage, climate regulation and recreation opportunities. DIVERSITAS (the Latin word for “diversity”) was established to address the complex scientific questions posed by the loss in biodiversity and ecosystem services and to offer science based solutions to this crisis. Providing the sound scientific basis for decisionmaking to secure the planet’s variety of life, while contributing to human well-being and poverty eradication. Developing biodiversity science capacity by nurturing younger scientists around the world. May I use the opportunitiy to point the SkS team to one journalist who really tries hard to promote the many difficult issues around global warming and especially the arctic regions: Irene Quaile with her blog "Ice Blog" on dw.de (Deutsche Welle, a state owned broadcast). Throughout the years I've really learned to love her coverage and the great photo material on her blog. An epic fail indeed - by Roy Spencer. See Glenn Tamblyn's comments at Roy's blog here. Lesson No.1 - if it looks bogus, it probably is. soo doh nim - As Rob said, Glenn Tamblyns (and Joel Shores) comments are an excellent analysis of that particular mess. The set of models Christy ran were for "Mid-Troposphere" using one of the highest IPCC emission projections (i.e., the top end of the model range), compared to the satellite TMT signals (with known stratospheric cooling components) meaning that that graph isn't even comparing the same atmospheric components. Nor have they sourced the radiosonde data - radiosondes and their reanalyses are an ongoing topic of evaluation. A more appropriate comparison is probably between those model outputs (with realistic emissions) and the UAH TLT or RSS TTT products; and it's noteworthy that if you compare apples and apples there is far less difference. The analysis reveals that the UAH TMT product has a positive bias [...] that artificially reduces the global TMT trend by 0.042 K decade−1 for 1979–2009. Accounting for this bias increases the global UAH TMT trend from 0.038 to 0.080 K decade−1, effectively eliminating the trend difference between UAH and RSS and decreasing the trend difference between UAH and NOAA by 47%. This inconsistency between model results and observations could arise either because “real world” amplification effects on short and long time scales are controlled by different physical mechanisms, and models fail to capture such behavior; or because non-climatic influences remaining in some or all of the observed tropospheric datasets lead to biased long-term trends; or a combination of these factors. The new evidence in this Report [...] favors the second explanation. In short - the graph is nonsense, lacking context. soo doh nim - Add in the fact that the satellite line in Christys graph appears to be the average of the RSS (~0.09C/decade, not inconsistent with model results) and UAH (~0.03C/decade) TMT data - the UAH data as produced by Christy and Spencer is a clear outlier. This factor of 3x difference was, I'll note, not discussed by Spencer in his presentation. Quite frankly, the outlandish accusations accompanying Spencer's blogging of Christy's graph say it all: with claims of the mainstream having "willingly ignored the evidence", "their willful blindness", and complaints that "scientists who still believe that climate change can also be naturally forced have been virtually cut out of funding and publication by the ‘humans-cause-everything-bad-that-happens’ juggernaut", Spencer is showing classic signs of denial. See Characteristics of global warming consensus denial #5, Conspiracy Theories. Thanks, guys. I debate these things in other forums and can use all the ammo I can get. Thanks again! Thanks for noticing my essay! I couldn't have done it without SkS! [JH] On behalf of the entire SkS team, "You're welcome."